When it comes to a flexible, scalable and reliable web infrastructure to operate a business, Cloud hosting becomes the most ideal solution nowadays. It is a cost effective solution as well, since the charges are limited to only those resources that users use. Hosting costs are offered in a way that it provides the most control on users hosting budget for example on usage hour, traffic volume, special pricing for sudden traffic spikes etc. Service up-gradation and expansion, as business demands, are easily possible without expenses on costly devices. Content security is ensured by distributing data across redundant servers. The cloud protects hosted information against hardware failure. Automated backups ensure up-to-date content access to the users. It is just a “One Click” solution to multiple web requirements to operate any business. Cloud hosting is a web hosting service delivered from a group of connected servers. In general, a hosting service can be considered cloud hosting when it is delivered from a fully redundant, multi-server system, in which the resources are dynamically scalable and often virtualized. A cloud hosting service is usually delivered from a load-balanced cluster server platform, while the data is stored in a SAN (Storage Area Network). Cloud hosting providers measure compute cycles, an indicator which measures how much processing time applications require. This enables cloud hosting to be provided and billed as a part of a different service model than that used by other web hosting services. Scalability; customers can easily increase or decrease resources without moving sites to other servers. Servers can be deployed instantly. It provides better uptime than other types of web hosting. Traffic spikes aren't a problem; the cloud can handle them. If the servers are in different datacenters, datacenter problems can be less of a concern. Different technologies can be used together that can't be used together without cloud hosting. For example, .PHP and .asp files can work on the same site, even in the same folder, drawing on technologies within the cloud. Users need not to install hardware or software. Instead, they can connect with a cloud that has the hardware or software they require. The hosting services are provided in different forms to the users. These forms can be listed into three broad categories based on the type of usage and the amount of investment to be made by clients around the cloud space. 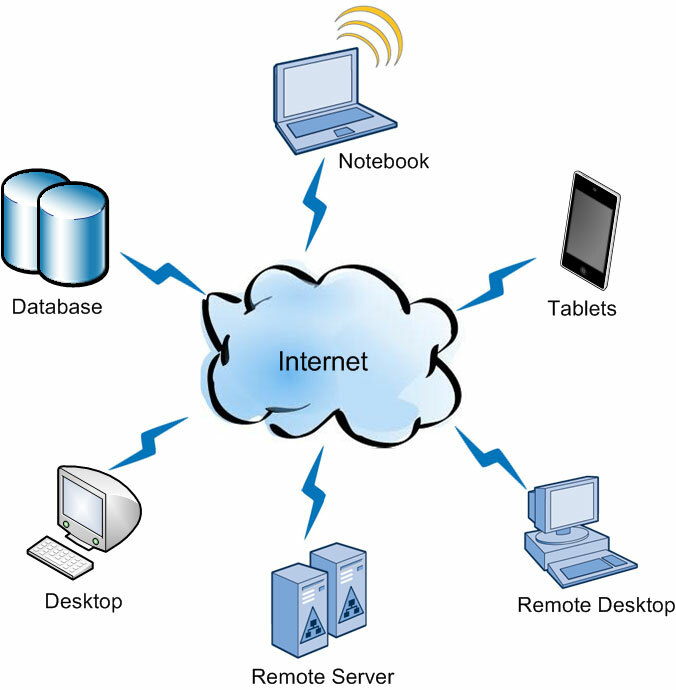 Cloud Infrastructure services, in general, refer to computer infrastructure services, storage and networking services. Instead of spending on purchasing software, servers or other network equipment, users can easily outsource these services from a third party. The advantage of this type of services is that users pay for only that amount of resource that they use rather buying a whole equipment-set for the purpose. The services that fall into this category are installing virtual servers on vendors IT infrastructure, virtual-machine disk image library, block and file-based storage, firewalls, load balancer, IP addresses, virtual local area networks and so on. IaaS services provide users the necessary infrastructure on top of which they can run platforms as and when they require. Platform as a Service layer lies on top of IaaS layer. As the name says, platform is supplied to users to serve as computational resource to them. Developers use this service as a framework to develop or build customized applications. Availing PaaS services eliminates the cost of purchasing essential hardware-software layers while the users can develop, test and deploy applications in a quick, simple and cost-effective way. As a PaaS service vendors provides runtime systems (like java runtimes), middleware, Operating systems, virtualization, web servers, Databases, storage to manage applications and data of users. Software as a Service (SaaS) is the most popular form of cloud service. In this form of service, clients access applications directly through web browsers/ client apps without having the need of installing the software into their local device. As a result clients can experience a speedy access to necessary application-software, often refer to as on-demand software. SaaS makes it easier for enterprises to reorganize, upgrade and simplify their IT infrastructure. Few examples of SaaS services are e-mail services, office tools, social networking services etc.